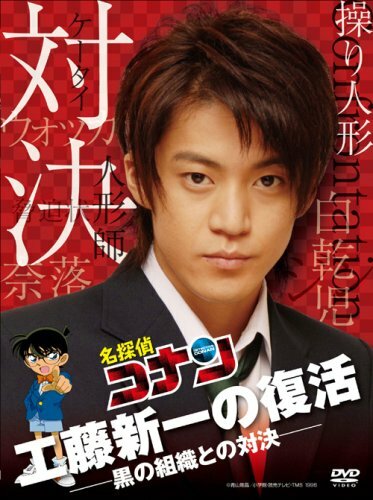 Conan is living in the home of his old girlfriend Ran, who doesn't know that Conan is her former boyfriend Shinichi. They go to a hotel where a beauty pageant is being held. The winner of the pageant is being blackmailed. At the reception, Conan eats some cake that makes him sick, but when he recovers he finds he has been restored to his old self, Shinichi Kudo. He starts investigating the blackmailing, which seems to be the work of the Black Organization, but the winner is killed. Raiza Apr 27 2018 2:17 pm I wanna know who are the two chibi actors for Edogawa Conan and Haibara Ai.. the shrunk ones.. They look really suited for those two roles.. and they are kawaii!! esa wahyu hidayat May 24 2012 7:05 pm How can I get that movie.?? I just love that movie very much..
4ll3nKui Dec 29 2010 2:35 am whooo i luv conan! !But how come ran-neechan after she protect haibara-san then she just stay there and do nothing?Just wait for conan to be kidnapped...hahahaha!! Your last word should be Gambate not gambare!! sarina Dec 21 2009 8:07 pm i just loveeeeeeeeeeeeee !!!!!!!!!!!!!!!!!!!!!!!!!!!! this movie , comic its soooooooooo cute and exciting and conan is so cute . ayranne Aug 20 2008 8:11 am love this story very much......hope there will be other story like this story..... gambare!!!!!!!!!!!!!!!!!!!!!!!!!! !